All of our hiking and via ferrata highlights in the Dolomites have been the preferences of our customers in the past 25 years of our Mountain Guides School. With our proposal of the Brenta Trek, we would like to offer a 5 days trip from hut to hut crossing the entire Brenta Dolomites Group, with overnight stay in the mountain lodges, suitable for everybody. The participants only need to have a good physical condition and some experience in the mountains. This via ferrata course is destined for people who love mountain, and for whom who would like to try themselves in the vertical world in complete safety. The rock climbing experience on the first day is very important for the performance of our via ferrata courses and trips. 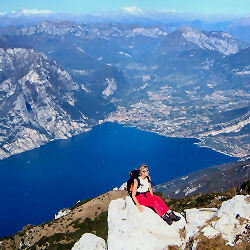 The next two days we will climb the most beautiful via ferratas in the Lake Garda area. The offer of the mountaineering School consists of the Crossing of Brenta Group from North to South in five or three days from hut to hut. The layer conformation of the rocks in the Brenta mountain group permits the access to the many ledges which are cutting the big walls transversely. On these ledges are running the via ferrata delle Bocchette, from one pass to another, across the entire Brenta Group. Teambuilding outdoor incentives in the Dolomites at Lake Garda and in the Alps of Italy for canyoning hiking rock climbing trekking mountain lodge by alpine guides. Overnight stay in hotel. Travelling to the South, Lake Garda represents the first region with a Mediterranean climate and flora. It brings us the gift of a last and unexpected breath of Mediterranean air before reaching the passes of the Alps heading North. The intense blue of the Lake is touching the mountains, the olive branches are speaking with the wind and the lemons are maturing in the sun. The same atmosphere and natural beauty has become the ideal scenario for a vacation where it is both easy to relax and have fun: sailing and wind surfing on the waves, mountain biking and rock climbing in the mountains or canyoning through exciting torrents are just some of the daily sports in a world where it is easy to encounter history by visiting some of the many old castles in the region. Trentino is all of that: a world at man' s dimensions where different flavors of food and a big number of hotels around the Lake are offering every type of accommodation in Trentino style which means clean, traditionally comfortable and nice as well as reasonably priced. The activity of our rock climbing School in Arco Trentino is extremely various: guided mountaineering trips every distance and difficulty - via ferrata trips and courses on the tracks of World Wear 1 - multipitch rock climbing traditional routes on big walls up to 1200 m high - rock climbing courses. We have more than 50 climbing spots in the area. Our mountain guides are born here and have fun to guide you on every hiking trekking or climbing trip. A world of green valleys, huge polychrome walls and pillars make it seem impossible that only 200 million years ago these mountains were a flat ground under the Sea. The fossil layers created this multicolor quality of rocks when a trouble of the earth pushed up the platform to the actual height of 3000 meters. The erosion of water and ice left behind the actual unique environment where people and bears can live together. For 30 years the Brenta and Marmolada mountains have been the kingdom of our rock climbing School. The Brenta mountains are appropriate for every type of mountaineering activities like walking hut to hut, via ferrata trips. On the more than 1000 m high walls generations of alpinists have climbed thousands of adventurous rock climbing itineraries. The Brenta Group is only 70 km far from Arco. Therefore our favorite location for via ferrata course and trips are on the famous via ferrata Bocchette di Brenta: a long guided trip through the entire mountain group. New and interesting is the Brenta trek Dolomites which is an awesome guided trip from hut to hut. 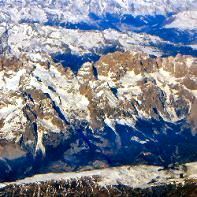 The Marmolada Dolomites also in the Trentino province, is offering two different faces: on the South there is a large vertical wall on which there are a lot of very difficult multipitch rock climbing routes up to 1200 meters length. On the North face of Marmolada there is a glacier famous as skiing area. The Marmolada glacier is precious for our alpine base courses because it is only a 20 minute walk from the mountain lodge “Pian dei Fiacconi” and suitable for our lessons on ice. Kalymnos is a small Greek island which makes part of the Dodecanese archipelago. It is located North of the more touristic island of Kos, not far from Rhodes and the Turkish coast of Bodrum. Kalymnos' dimensions are ca. 25 x 10 km. In the past, the island has been famous for its sponge divers. Up to the year 2000 the hotels on Kalymnos have been open only from June through September. The first rock climbers which came to Kalymnos found their first accommodation in the so-called "studios": small apartments with kitchen. 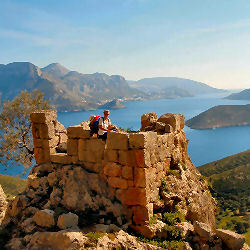 Nowadays thanks to the climber tourists the best hotels on Kalymnos Island are open from May to October. Everywhere on Kalymnos Island there are mountains, crests, ridges, antique monasteries and small deserted bays were you can swim alone. Sometime you visit villages where the friendly inhabitants are happy to ask "How are you?" because this is the only phrase they know in English language. Walking on Kalymnos Island is a great satisfaction for everyone: You have to train your senses to find the direction, everywhere you encounter silence, beautiful views and your only company is goats. We discovered Kalymnos Island many years ago as rock climbers but now we are also offering guided tours to our clients which gives them great satisfaction. Every spring and fall our mountain guides are happy to take off towards the Greek Island for a walking week. During the First World War, the borderline between the Italian and Austro-Hungarian forces ran through the Dolomites. Italian as well as Austrian soldiers had built many shelters and barracks on these routes in the Alps. After the war the local people carried concrete and equipment on their own shoulders for the reconstruction of the mountain lodges to make them suitable for shepherds and hunters. Nowadays the mountain lodges in Trentino are owned by the CAI (Italian Alpine Club) and are rented out to the called "gestori" (managers) in high season. The “gestore” must provide for food and drink being carried up to the mountain lodge by cableway or helicopter because there are no roads, no cars, no traffic. Every day he must provide for water and electricity by generator as well as control the cleaning of the water outflow. At night he must answer the bookings from overseas and reply to customer complaints ... a cold shower! Please be nice to him, he has a very hard job and is doing his work with passion for mountaineering! Our Alpine School Arco uses the mountain lodges in the area almost only as restaurant during the breaks of our guided routes. 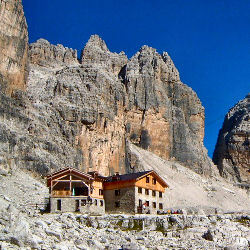 The mountain lodge Rifugio Agostini in the Brenta is our base camp for the via ferrata courses and Brenta Trek trips. The Rifugio Pian dei Fiacconi in the Marmolada mountains is the base camp for the alpine base course of our rock climbing School.